Jan 9, 2014; Cincinnati, OH, USA; Xavier Musketeers guard Semaj Christon (0) shoots during the second half against the Marquette Golden Eagles center Chris Otule (42) at the Cintas Center. Xavier defeated Marquette 86-79. CINCINNATI — Semaj Christon isn’t a big talker, although he’s trying to be more vocal this season. There is no doubt that he is a big-time player for Xavier no matter how he shows it. Christon had a career-high 28 points, including hitting consecutive 3-pointers to break a 69-69 tie with 4:14 remaining and lead Xavier to its eighth straight victory, 86-79 against Marquette Thursday night at the Cintas Center. The win improves Xavier to 13-3 overall and 3-0 in the Big East. The Musketeers aren’t a one-man show by any stretch of the imagination but they do have a front man in Christon. Thursday was just an example of how good the sophomore can be. Christon had been doing more of the little things the last few games, things like dishing out 25 assists compared to just one turnover in his previous four games, but Marquette gave him some freedom Thursday and he took advantage of it. "I really don’t think they needed me to score a lot, I just took the open shots they gave me," said Christon. "I made a couple of tough ones but I don’t think they really needed me to score. It’s just that I was open and I shot." Christon made 8 of 10 shots from the field, including all three 3-pointers he took. He was also 9-of-10 from the free throw line, part of Xavier’s overall 32-of-41 (78 percent) performance. Christon had 17 points at halftime, including scoring nine of Xavier’s final 11 points of the half and 11 points in the final 5:35 of the half as Xavier took a 40-34 lead. "I’m glad he didn’t score 50," said Marquette coach Buzz Williams. "He’s really explosive in transition. He had 16 assists and zero turnovers (in last two games) playing off the ball. He puts a lot of pressure on you in transition. He’s really good with the ball in his hands in the half-court. He made two really huge shots from three in the second half when it was 69-69. He hit those threes with Derrick Wilson in his face. "He’s a first-team all-conference player." The game was a matchup of the top two defenses in the Big East; Marquette is No. 1 allowing 61.5 points per game, while Xavier was second at 63.6 points per game. Somehow, an offensive slugfest broke out. Xavier’s 86 points are the most allowed by Marquette this season. The Golden Eagles dropped to 9-7 overall and 1-2 in the Big East but five of their losses have been by eight points or less. Marquette came into the game shooting just 30.5 percent from 3-point range but made a season-high 11 in this game, including five of its first seven attempts. Xavier had a 12-point lead, 46-34, in the second half but the Golden Eagles started finding their range again and tied the score three times — 60-60, 62-62 and 69-69. Christon made just seven 3-pointers as a freshman. He attempted just 28 shots from beyond the arc. He’s a slasher, a driver and a finisher. He’s becoming more of a shooter, now, as well. Thursday was the first time he’s made three 3-pointers in a game. He’s now 10-of-22 on the season. There was no hesitation as he let go either of his late 3-pointers. "It’s just having confidence," said Christon. "Once I made the first one I felt like I could shoot it and hit it again. It was just confidence. My teammates tell me to shoot when I’m open. We practice it every day." Marquette led the Big East in rebounding margin, pulling down an average of 6.5 more rebounds than its opponents per game, but Xavier out-rebounded the Golden Eagles 39-20 even though starting big men Matt Stainbrook and Isaiah Philmore missed much of the first half with two fouls. Stainbrook and Justin Martin each finished with eight rebounds. Martin added 15 points, while guard Dee Davis had 13 points and six assists, and James Farr had 10 points and four rebounds. 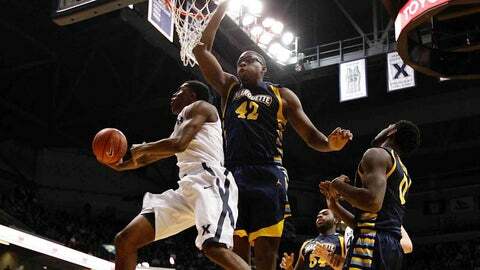 Xavier held Marquette center Davante Gardner in check. Gardner did score 19 points but he had just four rebounds. Yes, Xavier is no one-man show but there is no doubt who their No. 1 guy is. "Semaj was terrific. He was sensational," said head coach Chris Mack. "He was the best player on the floor."